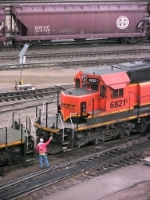 Title: FURX leads a BNSF. Description: P-CHILAU. On a rainy, cold day. Description: CSXT Southbound Molten Sulphur Train K869 rumbles through Lineville, Al. Description: CSXT Southbound Molten Sulphur Train K869 ( Bensonville, Illinois to New Wales, Fl. ) passing through Lineville, Al. Description: It was a shame this freshly painted 6821 couldn't have been on the point of the Circus Train's northward trip from Portland. Description: Freshly repainted BNSF 6821 on the RBB Circus Train in Everett. Description: RBB Circus Train pulling past SeaLine Jct with 8 carloads of elephants to setout on the NP Main. Description: westbound at Sylvan st crossing, west of NR junction signals. Title: BNSF passing St Pauls Daytons Bluff yard in 2007. Description: The CB&Q had a large yard here, the Milwaukee hump yard, and CGW transfer yard back in the 1960s. Rarely do you see an SD40-2 leading Dash 9s. Title: BNSF 1078 & Co. Description: The 6821, one of the few Swoosh'd SD40-2's, is shown here at the service tracks at Northtown. Note some of the new additions, including a electronic handbrake, a new bell, and even retains its builders plate! Description: More of a roster shot of the rare Swoosh SD40-2. Its too bad that time ran out on these so fast. Description: The hostlers assistant helps make a joint between two BNSF SD40-2s, 6821 and 6813. 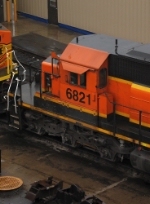 Description: BNSF 6821 gets pulled out of the shops and will soon be coupled to the 6813. It was great seeing SD40-2s in the shops again. Description: The 6821 is stilll sitting here, but the 8029 which was thought to have been done for after getting swiped at Pigs Eye now sits outside with some new panels and repairs made. Im guessing who ever is the lesser to these units needs them to be repaired in order to be returned. Description: I dont think I'll ever get this one leading. Description: An engine that I've become familiar with to say the least, sits once again at Northtown getting inspected. Who knows if it will leave here again as the same number. Description: An eastbound freight led by two SD40-2s crosses the flooded Red River and enters Minnesota. Lots of debris has piled up against the trestle.